Cadillac begins a new chapter in its high-performance legacy with the introduction of the brand’s first-ever twin-turbo V8 engine. It is the centerpiece of the new CT6 V-Sport, a sports sedan infused with DNA of Cadillac’s motorsports program. 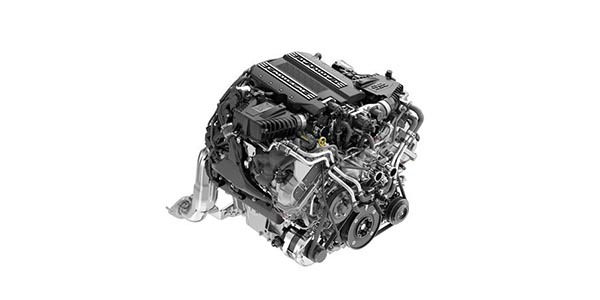 Developed as a small-displacement V8 in the classic vein and offering exceptional power density of 131 hp per liter, this new Cadillac-exclusive 4.2L Twin Turbo V8 — GM estimated at 550 horsepower and 627 ft.-lbs. of torque — elevates the CT6’s performance to a new plateau. An optional 500-horsepower version will also be available. 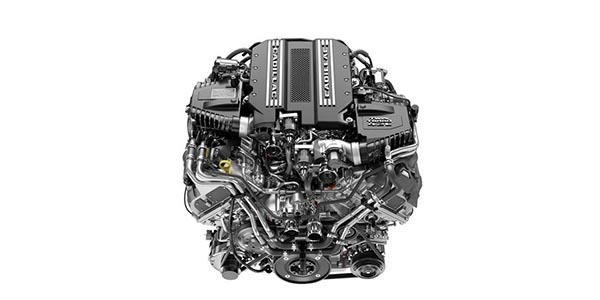 The new Cadillac Twin Turbo V8 is a clean-sheet design that also introduces unique design elements developed to balance performance and efficiency with compact, mass-efficient packaging. At the center of the 4.2L Twin Turbo V8 is a “hot V” configuration that transposes the conventional layout of the cylinder heads’ intake and exhaust systems to mount the turbochargers at the top of the engine — in the valley between the heads — to virtually eliminate turbo lag and reduce the engine’s overall packaging size. Each engine will be hand-built at the Performance Build Center in Bowling Green, KY. 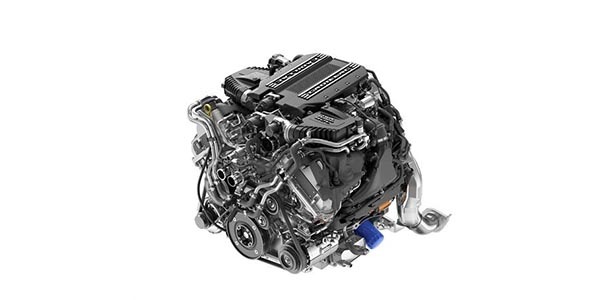 The new Cadillac Twin Turbo V8’s foundation is an all-new, durable and lightweight aluminum cylinder block that houses an equally robust, lightweight rotating assembly composed of a forged steel crankshaft, forged steel connecting rods and high-strength aluminum pistons. The crankshaft’s 3.55 inch stroke complements the cylinder bores’ 3.39 inch diameter to give the engine its 4.2L 255 cubic-inch displacement. The turbochargers produce up to 20 pounds of boost and are matched with electronic wastegate control for more precise boost management and more responsive torque production. In fact, 90 percent of the engine’s peak torque is available at only 2,000 rpm, and it is carried through 5,200 rpm for a confident, virtually bottomless power reserve. The intercoolers lower the air charge temperature by more than 130 degrees F, packing the combustion chambers with cooler, denser air. Also, the system achieves more than 80 percent cooling efficiency with only about 1 psi flow restriction at peak power, which contributes to fast torque production. The new Cadillac Twin Turbo V8 is matched with a 10-speed automatic transmission. Its wide, 7.39 overall gear ratio spread enhances off-the-line performance and contributes to reduced engine speed on the highway, which enhances refinement and efficiency. Smaller steps between the gears also help the engine maintain the optimal speed for maximum power at almost all vehicle speeds. Direct fuel injection is used to optimize efficiency and performance. With direct injection, a higher compression ratio — 9.8:1 — is possible because of a cooling effect as the injected fuel vaporizes in the combustion chamber, reducing the charge temperature to lessen the likelihood of spark knock. A pair of engine-mounted, camshaft-driven high-pressure fuel pumps supplies fuel to the specialized injectors at 5,075 psi, with each pump supplying fuel to one bank of the engine. Dual overhead camshafts and a virtually silent chain-driven valvetrain contribute to the smoothness and the high output of the Cadillac Twin Turbo V8, while dual independent continuously variable valve timing helps deliver optimal performance and efficiency. The dual independent system, which allows the intake and exhaust valves to be phased at different rates, promotes linear delivery of torque with near-peak levels over a broad rpm range, and high specific output (horsepower per liter of displacement) without sacrificing overall engine response or drivability.